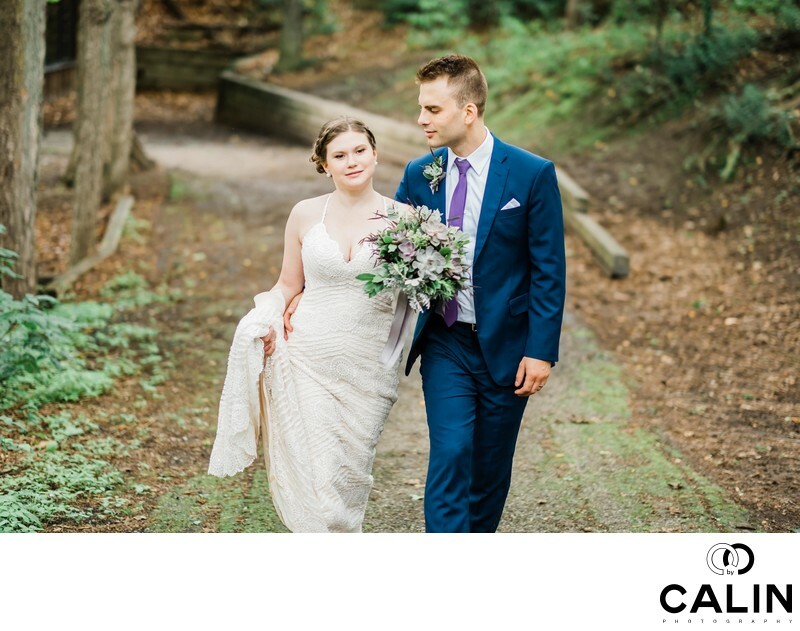 Soon after the Kortright Centre wedding ceremony that took place at the Cathedral of Trees, the bride and groom decided to take a few minutes for themselves. I decided to follow them, with my second shooter, so that we can take a few candid photographs of the couple. Is common for many artists to like posed imagery because honestly, it is easier to achieve. Especially when we photograph at the very shallow depth of field, it becomes crucial to have good reactions and to know your equipment. For example if you use a 85 mm f1.2 lens, even the slightest move of the subject can throw it out of focus and make the photograph unusable. As a Toronto wedding photographer, I love dynamic photographs that capture emotions that unfold during the event. As such, for the documentary images, whenever possible I try to use a wider depth of field and shoot it at f4. Combined with the fact that the cameras I use have crop sensors and create a wider depth of field, that technique makes it perfect for photojournalistic pictures. Even if sometimes things run quickly and because of the low light levels I have to resort to a slower shutter speed, a slightly imperfect image that captures great emotions is better than no image at all. For example, in the picture above, the ring bearer started running on the dance floor during the first dance. As you can imagine, I have enough time to position myself in the perfect spot to achieve the best composition possible, but I was able to capture the moment because I knew the limitations of my cameras. Also, my experience as a professional photographer and the hundreds of ways that photograph played an important role here. I often find clients who do not understand the math behind prices. Many people think that photojournalists only take a few pictures for eight hours then deliver them to the clients. Nothing could be further from the truth. In fact, the essence is training your mind to understand the visual patterns, to anticipate moments, to think creatively, often under severe time constraints. That often takes the artist years of practice, errors and trials and literally millions of wedding photos critiqued, analysed, and improved over time. The perfect wedding album you see during the bridal shows is a result of tens of thousands of hours of practice, study and hard work. Without the artist's passion, your wedding photos will look cliché and soon be outdated. My point? The style is refined over time and on your wedding day, you see the pinnacle of the artists' efforts. Often, the clients appreciate more the photo booth pictures than those taken by a professional photojournalist. 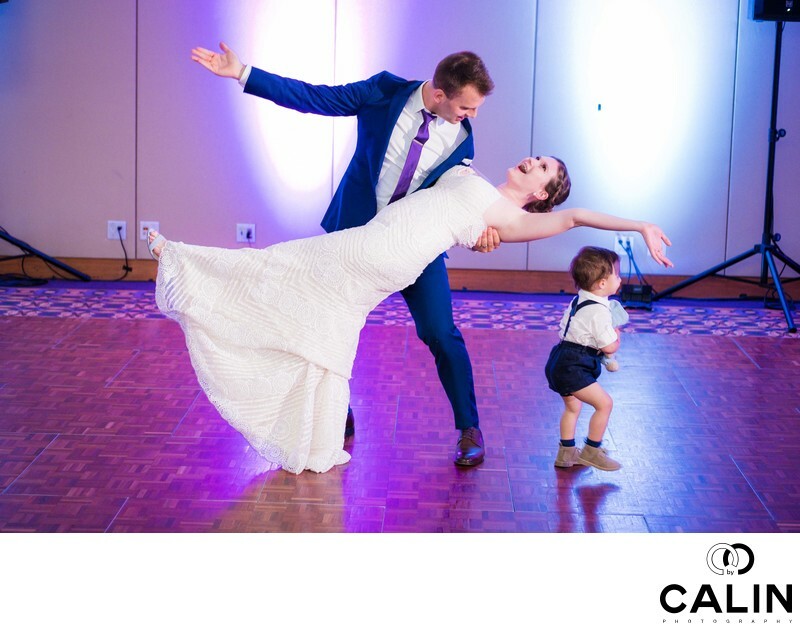 Fun wedding photos are absolutely crucial to capture the atmosphere of your event. However there will be lots of people who a few decades down the road will not be among us anymore. Photography is about capturing the presence of those people in beautiful images that will preserve their memory over time. While images of the event space are important, they should not trump those of the family and friends. For the environmentally conscious citizens, Kortright Centre for Conservation is the perfect location for their event. The establishment is a nonprofit organization that uses only renewable energy and sustainable technologies. Besides the main attraction, the magnificent pine and maple trees that surround the visitor centre, during the winter your guests can enjoy the Sugarbush Maple Syrup Festival. Please note that this is one of the most sought after marriage locations in the GTA. Kortright Centre is a nonprofit organization that donates all proceeds to educational programs.